Home > Humor / Fun > Life with God > Nashville, TN > Observations / Reflections > How Do the Cookies Know? So, how do the cookies know? Seriously, how DO they know? It can feel kind of eerie sometimes. 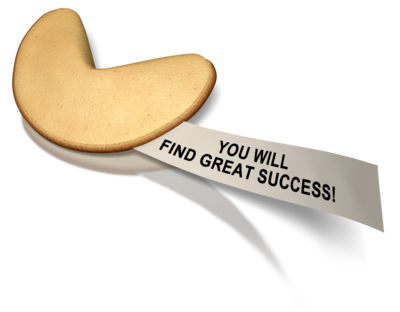 There you are, eating in your favorite Chinese restaurant, and after the meal you open your fortune cookie and BLAM! You get blindsided by a little message that seems to be right on target. Like somebody’s reading your mail. My wife and I had just finished a meal at our favorite little Chinese buffet a few years ago. She opened her cookie first. “A new friend will soon bring much happiness into your life.” Hmmm. I opened mine. “Look to purple to lead the way.” Huh… Not much there. We chuckled and left the restaurant. An hour later we walked out of the Humane Society animal shelter with our newly adopted doggy “friend,” a charming little curly-haired “mutt” wearing the purple flannel coat she came in with – leading the way to the car. She has brought us years of happiness. How do the cookies know? Our every request, however slight, was met with a scowl, a sigh, and/or a rolling of the eyes. Every little thing was a BIG DEAL. She was stressed, but she was actually manufacturing quite a lot of the stress herself. The waitress’ attitude cast a shadow over our whole dining experience, creating tension and irritation in the wake of a very joyous family event. At the end of this very tense meal, I opened my fortune cookie. I exploded in laughter and had to pass my “fortune” around the table. We all laughed for about five minutes. “It’s a good thing that life isn’t as serious as the waitress thinks it is!” We had our joy back. How do the cookies know? Though their insight and perceptivity can sometimes be uncanny, oriental baked goods are typically not the first place you turn when you’re looking for answers – and perhaps not the best place to look. And, about ninety percent of the time, fortune cookie messages are irrelevant at best, and incomprehensible at worst. Like the one I got that said “You are the only blossom in the garden of meditation.” I’m the WHAT? Whatever the future holds, there is really only One who holds the answers and really knows. And His love and care lead the way to a life full of surprises and adventure.